During the 25-plus years I’ve known Ira Chaleff, I’ve become increasingly impressed with the pioneering nature of his work. During the 25-plus years I’ve known Ira Chaleff, I’ve become increasingly impressed with the pioneering nature of his work. When I met him, he was an executive coach working with members of Congress and international clients. He has served as a business consultant for world leaders and foreign governments. In 1995, he published “The Courageous Follower: Standing Up to and for Our Leaders,” now in its third edition (Berrett-Koehler, 2009). I interviewed Chaleff about aspects of this groundbreaking book that can benefit financial advisors and their organizations. Mellan: How did your interest in “courageous followership” evolve? Chaleff: I’ve always been interested in the beneficial use of power. 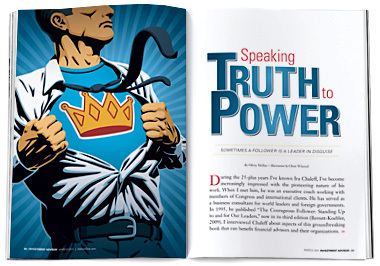 How can we help leaders who acquire power to use it well? How can we minimize the misuse or abuse of power? There’s a cultural misconception that following is a passive act. It’s not. It’s a partnership that recognizes different responsibilities while working toward a common goal. The way you play the follower role with strength is first to be committed to serving the organization and its leaders. That gives you a platform for questioning those leaders if you feel that what they’re doing is not serving the common goal well, or violating the values that you believe the firm should be living by. Implicit in the follower role is that you may not always agree with a choice that the leaders have made. Nevertheless, as long as that choice has a reasonable chance of achieving the company’s goal and doesn’t violate its core values, your responsibility is to subordinate your own preferences and support the firm’s leaders. That’s mature professionalism. On the other hand, if you feel that what the leaders are doing is counterproductive to the common goal, or violates its core values, it’s your responsibility to candidly address those issues with the leaders. OM: Your work has been applied to large corporations and governments. Can it also benefit smaller companies of two to 10 people, like most financial planning firms? IC: My work is about relationships and these dynamics play out in smaller businesses as well as in large firms. “Leader” and “follower” aren’t personality types; they are roles we all play in different situations. In large and small groups, even in a marriage, sometimes we lead and sometimes we follow. OM: How does courageous followership relate to conflict resolution? IC: Both involve relationships. The distinction is that in courageous followership, we’re dealing with a perceived power differential in the hierarchy. It’s not true that the leader has all the power and the follower has none, but there are differences. OM: Let’s say you are a lower-echelon employee who doesn’t like what’s happening on the top level of your organization. How do you decide whether to speak to the boss or prepare to quit your job? IC: Unless there is serious illegal activity, you should never think of leaving the organization without first helping the leaders become aware of the adverse impact of their actions. Only after you have made several attempts to communicate, with no sign that the leaders are serious about correcting the situation, should you contemplate other career options. If the objectionable behavior borders on unethical action, you need to take a very firm and early stance. Otherwise, once you begin colluding with these ethically questionable activities, you start down a slippery slope from which it’s hard to extricate yourself. OM: What makes it so difficult to speak candidly to higher-ups? IC: There are different styles of followership. Depending on your style, you may feel more inclined to be candid despite the risks. There’s the resource style, where you do an honest day’s work, but don’t go out of your way to either support or challenge the leader. In the individualist style, you are willing to question the leader, but don’t offer any support, so you marginalize yourself. Implementer-style followers provide excellent support, but are reluctant to ask questions, leaving the leader vulnerable to his or her own blind spots. If you are a partner-style follower, you are strong in both supporting the leader and, when necessary, questioning or challenging his or her behavior. When you take this last approach, a good leader will come to value your input and your counsel. OM: What keeps those of us who are reluctant to question the leader from doing so? IC: In some situations, people realistically worry that it will affect their promotion or retention. But research shows that the far more prevalent cause is fear of losing favor with the leader. So if we are experiencing this fear, we need to identify the source of it. Once we name the fear, we can manage it. OM: Where do you get the courage to do this, since it feels so risky? IC: People have different sources of courage. For some, it’s their religious values. For others, it’s a sense of justice. Still more want to uphold professional standards that they are committed to. And others are inspired by role models who have done difficult things in their lives. Courage is like a muscle: If we push ourselves to exercise it in situations of relatively small consequence, we’ll be better equipped when we need the courage to deal with a very serious situation. For example, if you are being enticed to direct a client toward an OK investment that’s not the best for that client, it’s better to resist temptation and recommend the best investment. If you come under pressure later to steer the client toward a truly poor choice, you’ll have developed the habit of courage to stand firm against that pressure. OM: Suppose you work for a firm that was originally committed to helping middle-class clients, but now plans to raise the minimum net worth it will accept. If you’re uncomfortable with this, what should you do? IC: It’s important to recognize that leaders, followers and clients all bring self-interest to the relationship. There’s nothing wrong with that, as long as it doesn’t corrupt the core values and common purpose on which the firm was founded. If you’re not comfortable with this decision, you need to take a stand early on in support of the values that the firm has stood for, so you can have an upward influence on what happens. You might agree to do your part in attracting higher-net-worth clients, while insisting on maintaining a certain percentage of mid-net-worth clients. OM: If an advisor who now works for a large planning firm is considering going out on their own, how can your process facilitate this decision? IC: There are a range of legitimate reasons for leaving a work situation. One of them is that you’ve done your apprenticeship, gained the experience you need, and you now want to test yourself in the world. That’s a positive reason for leaving, and hopefully you depart in an orderly and ethical way. At the other end of the spectrum, if you are uncomfortable with the values by which the firm operates and you’ve been unsuccessful in influencing the direction it is going in, it may be best to leave in order to create a company that reflects your own values. OM: What steps of your process should financial advisors and their staff be practicing or thinking about? IC: If you have to give candid feedback up the chain, or are faced with the need to do so, I would encourage you to read relevant chapters of “The Courageous Follower” to prepare more fully for what may be a difficult conversation. Test your views with trusted peers first. Frame your concerns in terms of what the leader values. Speak assertively enough to get the leader’s attention. Recommend specific changes that the leader can make. Be open to the leader’s alternative ideas of how to address the issue. Request follow-up on what the leader decides. Reconfirm your support for the leader and the firm. In a volatile age filled with risk and opportunity, it’s crucial to find the courage to support our leaders and “speak truth to power” when necessary. This is an important facet of exercising personal integrity in all areas of life—a source of the strength and self-esteem each of us needs to thrive. Read Part 1 of this series, "Resolving Conflict," from the February issue of Investment Advisor. Look for Part 3 of this series, “Restoring Trust,” in the April issue of Investment Advisor.